I need a system that ensures total design freedom. With seasonal energy efficiency fit for future requirements. even greater flexibility and up to 33% higher SEER and SCOP values. Lead. Extended. The new BC Controller of the VRF R2 system for simultaneous heating and cooling features dimensions that are 14% more compact, thus taking up less space. With up to 11 sub-controllers, it provides an entirely new level of design freedom. Boasting a whole variety of new design ideas, the City Multi VRF outdoor units achieve SEER values of up to 9.11 (PUHY-EP250YNW-A) and SCOP values of up to 4.82 (PUHY-EP200YNW-A) – a considerable lead in terms of seasonal energy efficiency. The overhauled design of the City Multi VRF outdoor units has enabled us to reduce the refrigerant fill quantity by up to 30%, a major benefit in terms of building certification and ensuring compliance with EN378. The maximum height difference between the outdoor unit and the indoor units located below is now 90 metres. The new BC Controller of the VRF R2 systems enables a maximum pipe length of up to 90 m between the main BC Controller and the indoor unit, making it possible to supply to very large building surfaces using a single system. The noise level can now be precisely configured in five levels rather than two and with a maximum reduction of 15 dBA to suit the requirements in different locations. These more exact gradations also ensure reduced power loss. 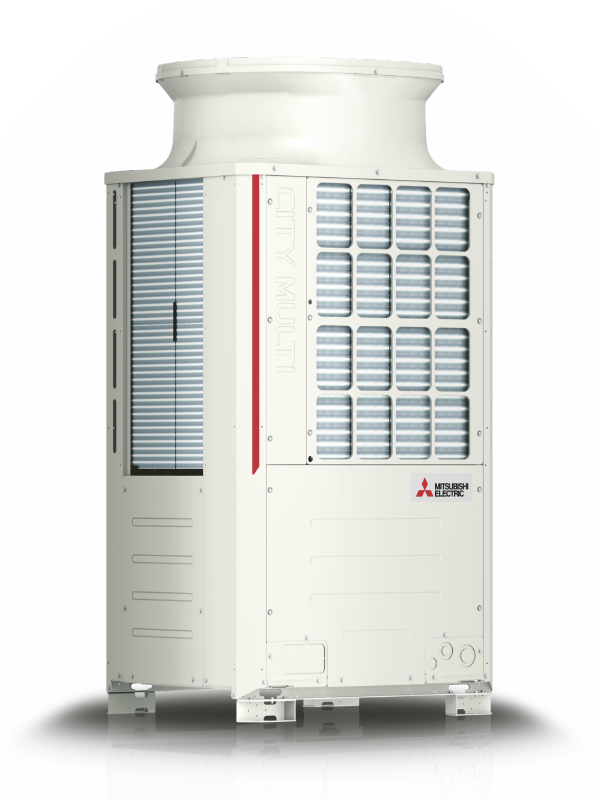 The City Multi VRF systems can be connected to a wealth of different indoor units from a variety of series. All indoor units from the Mr. Slim and M series can be used alongside the City Multi indoor units, providing the ideal solution for every situation. The City Multi outdoor units ensure milder blow-out temperatures on demand in spring and autumn, thereby reducing your energy consumption. The improved compressor featuring a multi-port mechanism and expanded control range achieves further energy savings in partial-load operation. Boasting more compact dimensions and up to 11 sub-controllers, the new BC Controllers enable even greater flexibility in terms of layout.